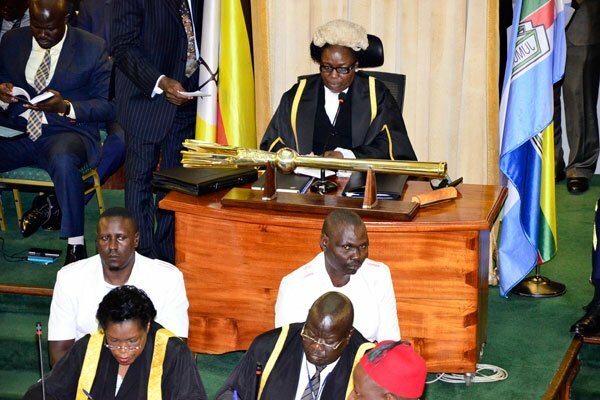 PARLIAMENT- The coalition of Indigenous Minority groups petitioned Speaker Rebecca Kadaga calling an end to violation of their social, economic, political and psychological rights. The group comprising of Batwa, Malagoli, Banyabindi, Beneti and Bamba, decried the continued sidelining in Government programs, arguing that this has left their lives at risk. In their petition to Parliament, the indigenous Communities pointed out forced land eviction and grabbing, as well as denial to health care services, saying this has left the marginalised people, despite being citizens in Uganda. While presenting the petition on behalf of the group, Elisha Mugisha, Omukama Wabanyabindi cited the forceful eviction of the marginalized people by Government in guise of carrying out development projects in their areas has been cited as a big challenge hence this has left many lose their identity and disrupts their cultural socialization. “These groups also don’t have hospitals, their women are left to give birth in banana plantations, they also face the plight of HIV where the Government programs don’t reach their communities,” she added. Kadaga assured the petitioners that Parliament is so much engaged on the issues raised by the minority groups and there is work in progress as a committee that was put in place to over the matter is already progressing. “I directed the Committee to go out and follow up on the issue of the Batwa. Two weeks ago, the Committee went to both Kanungu and Bundibugyo to follow up on the instructions of Parliament, so we are alive to these issues. We just need to ensure that all these others find space and visibility,” Kadaga said.